Most people wish they could carve a little more space out of their home, especially in areas used for entertaining family and friends. Here are some tips for increasing the function and use of space that you already have. If you are using your basement only for storage, you are potentially wasting a lot of existing space; by utilizing it, you can greatly increase your square footage. Of course, the first order of business is to make sure your basement is clean and dry. If there are any leaks through the floor or walls, get those repaired and live through a couple of rain storms to make sure that the room will stay dry. Basement waterproofing companies can also take care of any mildew or mold that might be hanging around from previous leaks. Once you know all is well, think about making the basement space as attractive and comfortable as the rest of your home. The walls are a major consideration. You can choose to install drywall or a wall finishing system. You can also carve out some extra entertainment space from your own backyard. A deck or patio lets you enjoy the great outdoors whenever weather permits and is a great space for grilling and chilling with friends and family. While a deck or patio will certainly extend your living space, it can only be used when the weather allows. 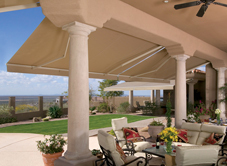 If you want to make maximum use of your outdoor space, consider enclosing your patio or deck with a three- or four-season patio enclosure. Three-season rooms are useable in all but the coldest months of the year; four season rooms have heating and cooling systems, so they are just as comfortable and functional as any other room in your home, 365 days a year. The great thing about utilizing basement or outdoor space is expanding your living space without the long wait of traditional additions. By choosing these two upgrades, you’ll be able to have a completely new entertainment space within a week, from start to finish.